Dressed in a charcoal grey suit and a beige shirt, Robert Pattinson looked very daper when he stepped onto the set of the Jay Leno show last Friday night. 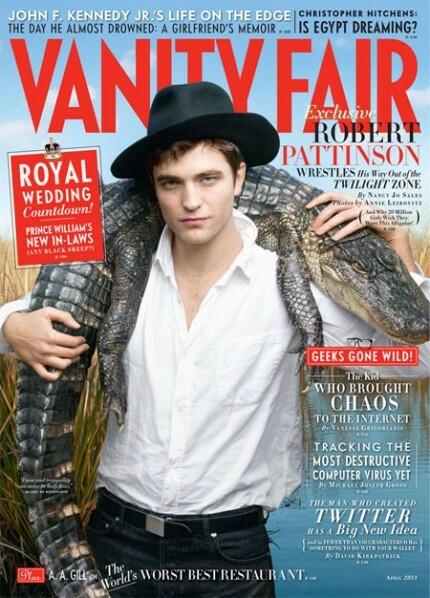 Promoting his upcoming film “Water for Elephants”, he spoke about his latest cover issue of “Vanity Fair” in which he has an alligator on his shoulders. “It took about five minutes, if you have got an alligator on your shoulder you can only have it there for about five seconds,” the "Twilight" star revealed. The star told Leno how he ended up getting involved in acting, due to his fathers influence. “He saw some pretty girls down in a restaurant one day and decided to ask them where they came from, and they went to the drama club and so I ended up going down to that place and that was it.